Every day for years I walked my dogs through the New Mexico desert observing the kinetic visual relationship between natural elements: how a flower follows the sun, a cloud kisses a hilltop or races behind a cluster of trees; or how trees huddle together in community. Do the flower, cloud or trees have consciousness? Is nature conscious? 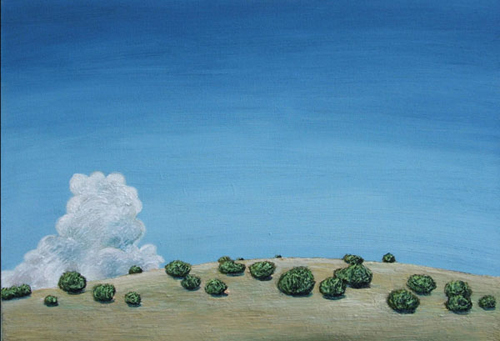 For this series of 20 I chose three motifs: a cloud, trees and a hill. I created relationships between the elements, in constant motion, as I observed them on my walks. I limited the palette to the same seven colors: olive green, indian yellow, cadmium yellow, flesh, crimson lake, cerulean blue and prussian blue to manage a unity among all the paintings. I experimented with texture, glazing and heavy applications to reflect what I believe to be a co-mingling of consciousness, energy, spirituality and natural form.